Did you know that if you fondled a woman’s breast, uninvited, it would cost you a fine of five shillings? 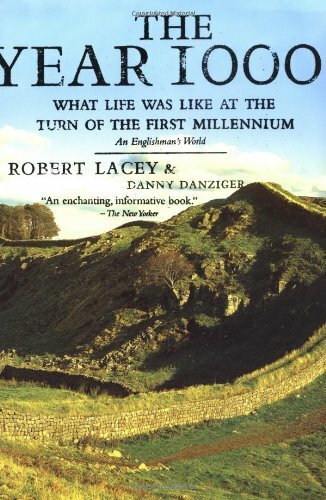 I just finished reading The Year 1000: What Life Was Like at the Turn of the First Millennium, by Robert Lacey and Danny Danziger. Don’t let the title scare you, because I have seldom read a more delightfully informative little book. I don’t know how they crammed so much information into just 200 pages (reminds me of Mark Kurlansky’s Cod in that respect, and this one doesn’t have recipes). The authors take something called the Julius Work Calendar, a medieval reminder of work and faith with wonderful illustrations, and use it to describe daily life in Anglo-Saxon England. About the easiest way into medieval studies I’ve ever stumbled across. One of my favorite little books… i have recommded it to several of my friends. I loved this book enough to ship it to Abu Dhabi where I’m living right now so I could pick it up when ever I felt like it. Another of my very favorites is The Crusades Through Arab Eyes.